Volunteers of all ages pitch in for Christmas at the Rocks. All photos by Carrie Deegan. This year at The Rocks Christmas Tree Farm, we are looking for 3-5 volunteers on each of the busiest pre-Christmas weekend days to help in the pre-cut Christmas tree area. 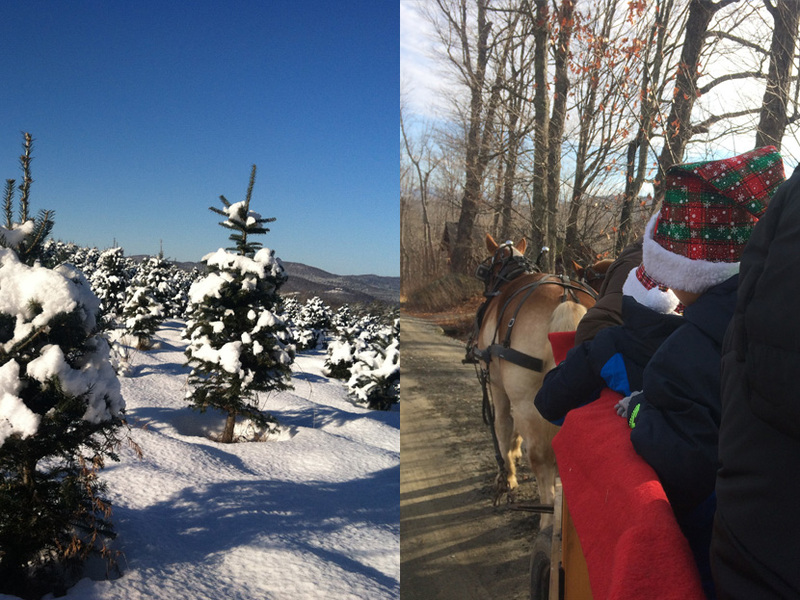 The Christmas season at The Rocks is magical, with horse-drawn wagon rides and carols and beautiful snow-covered views of the Presidential Range. This volunteer job involves helping families who want a pre-cut tree pick one out (letting them know the differences between Balsam and Fraser Fir, measuring trees for people so they know whether it will fit in their living room), keeping the pre-cut tree area stocked by putting new trees out as they sell, drilling holes in tree trunks for people using a cool Christmas tree hole drill, hauling purchased trees to the baler on wagons, putting out new wreaths, and keeping a s’mores pit burning. You’ll get a chance to go on a horse drawn wagon ride if you want, and it’s a good time to search for your own Christmas tree or look for unique presents in The Rocks gift shop. The Rocks staff will show you exactly what to do for volunteering, no prior knowledge necessary! Children can volunteer with adult parents or grandparents. Fill our our volunteer form or simply contact Carrie at cdeegan@forestsociety.org or 603-545-2992 if you want to help or have questions!